One of the wonderful things about starting LA Dance Review is that it has gotten me out to see shows I otherwise would not have known about. The reality is that there are many choices for the LA concert dance-goer and it is easy to stay in one’s own performance circle. Since founding LA Dance Review, I have seen more shows at new venues and have enjoyed a wider range of diversity and aesthetics. Kinection Dance Project’s Once a Stranger was a gem of a show! 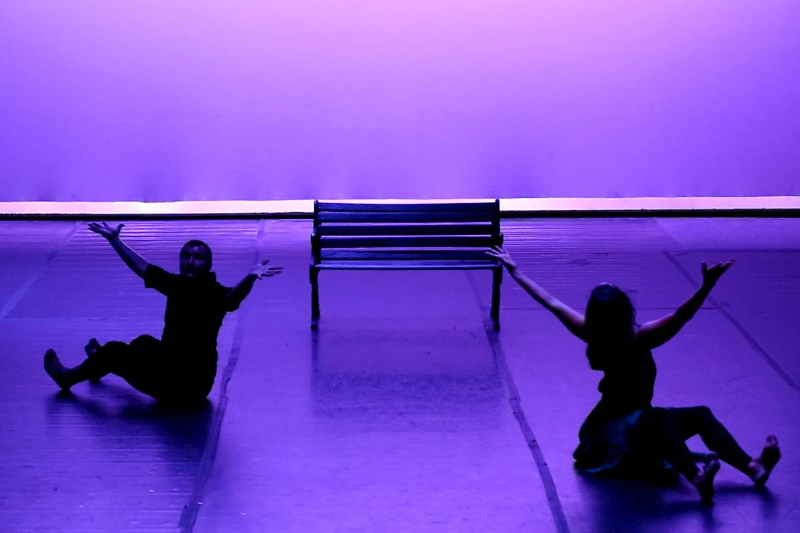 Founded by Bianca Blanco and Cesar Garfiaz, Kinection Dance Project aims to create dance that fosters human connection and last night’s performance was a huge success in doing just that. The show was a well-organized and passionately performed hour-long event, with each piece relating to the theme of human interaction. With Blanco and Garfiaz as the primary choreographers of the night, I got a strong sense that this quartet of dancers worked with a collaborative spirit, sharing their strengths and unique gifts in the process of creating this show. A highlight of the show was Blanco’s self choreographed solo, Cuéntame. The stage was set with a chair and a side table, topped with a whiskey decanter and glass. Blanco related to the empty chair with a deep sense of love and connection. I got a strong feeling that her father was sitting there, ready to tell her a story as she maneuvered in complex floor work before the chair. Blanco’s strength as a storyteller in movement captured the audience. 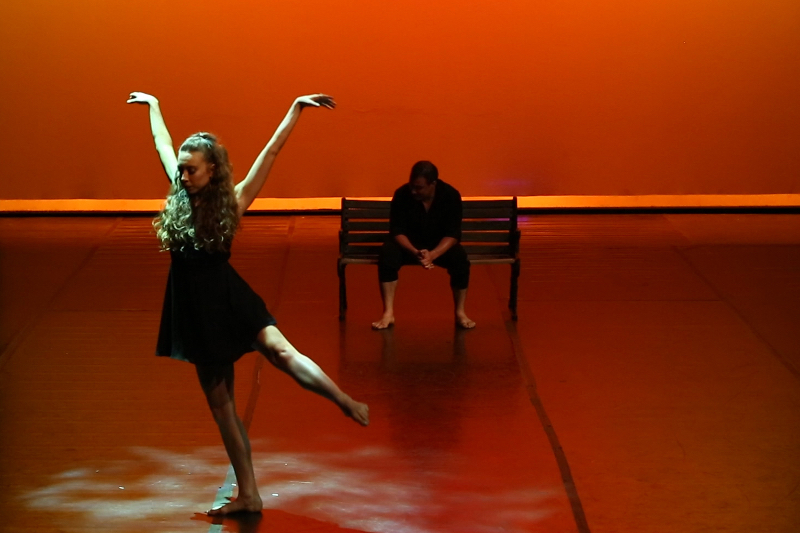 This authentic emotion, plus the dynamic use of repetition and rhythm in the choreography made this piece special. The sense of grief as she reached for the empty chair at the end was poignant without being over-done and touching without being overly sentimental. The sensitive subject balanced with the craftsmanship of the work made for a perfect mix. The piece following, ComMANdments, took the audience is a totally new direction. A parody on maleness, this piece had the audience laughing out loud. In this work, Garfiaz joined with two spoken word artists Bobby Gordon and Ary Katz to poke fun at the stereotypical man and his absurdist ways. The brilliance of these three men performing together was their incredible aptitude as male performers. as contrasted with their ridiculous claims about male superiority. The bottom line was that these guys were funny! Garfiaz displayed his strength and stamina in a b-boy blended solo while Gordon and Katz commanded the English language with rhythm, rhyme and wit. This piece was an excellent example of urban dance aesthetics seamlessly integrated into a concert dance format. The piece was a blend of three male artists being masculine and rough as only the most sensitive and refined artists can be. Bruja, choreographed by Blanco, displayed the flip side to this story with a trio featuring Blanco, along with dancers Veline Mojarro and Stephanie Castro. This female trio intertwined a suppressed feminine energy with a need to unleash that energy in an explosion of personal expression. This piece allowed each dancer to shine as in a momentary outburst of flinging arms, circling hips, rhythmic footwork and pulsing torsos. Castro’s balletic training generated a soft sense of the feminine that was sensuous and light but still quick and dynamic. Mojarro embodied her urban, Latin dance heritage, in a deep plié, rhythmic stamping, and undulating torso. But, all of this power was reeled in again as the women restrained themselves in the spirit of virginal expectation. The power of this trio was augmented by the following poem written and performed by Mojarro entitled Finding Inbetween. Mojarro stepped fully into her own with her rhythmic poetry jam style words and powerful dance underneath it. The design of the text and her total abandonment to the movement revealed her ability to command a stage on her own- strong, powerful, committed, engaged, patient and personal. A great as all of these works were, these artists were trumped by the star of the show, Maximo Garfiaz, in You’re It. You just can’t compete with a cute-as-a-button four year old boy dancing with his dad! Why is that? Because we love to see true authentic experience in motion. This is the goal of all dance and all performance art. The authenticity of the moment, the sheer joy, the sheer risk, the pure unadulterated experience is something we all yearn for, and children are able to give us. In this very sweet duet, Cesar Garfiaz ran around, tumbled and flew his son through the space, powered by pure love and enthusiasm. The son had complete faith as he flung himself at his father and gave him high fives in celebration of a job well done. I couldn’t help but think to myself- this is real dance. The show also included a handful of ensemble pieces and two duets by Blanco and Garfiaz. Overall, this show succeeded in creating a warm environment for the audience. The music was great, the choreography was well thought out and executed, and the tone of the evening was personal and relational. This company may not be the company of exquisite technique or virtuosic ability, but it is one that celebrates the human condition in a form of dance that is accessible for general audiences of all ages and backgrounds. There was so much packed into this hour long show I could continue talking about it for another 500 hundred words, but in closing I want to acknowledge this work as community engaging art that reminds us that we have the ability to connect, through words, through presence and through dance.